GADSDEN COUNTY, Fla — Health officials are warning pet owners after a cat tested positive for rabies in Gadsden County. 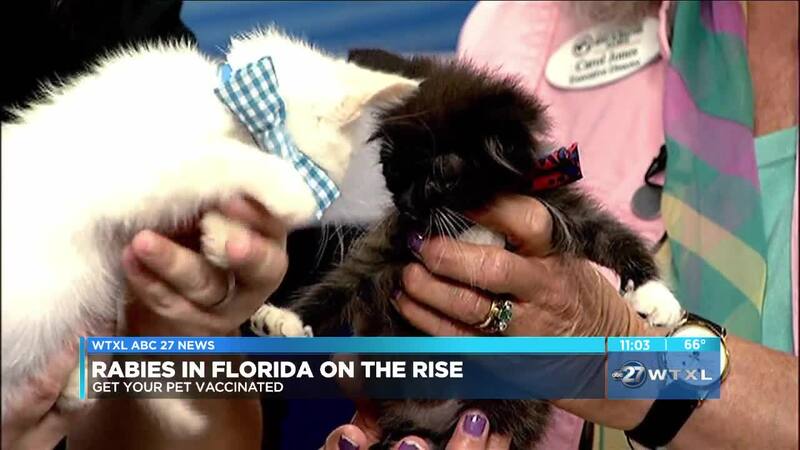 The Florida department of health says It's just one of dozens of confirmed reports of rabies in Florida in 2019 which is why they are trying to spread the word to vaccinate your pets. It started with a Quincy resident having to put down her cat after learning it had rabies and couldn't be cured. And other pet owners are taking the news seriously. "And I hope it does everyone the same way. It's an inexpensive piece of good mind, you know, to make you feel better about your animals," said Angel Granger. Angel Granger has what she calls "Noah's ark" on her Quincy farm full of everything except llamas and sheep. She says none of her animals have ever contracted the virus because she keeps her furry friends up to date on their vaccinations. "Animals depend on us to take care of them. You as an owner need to be responsible for your animal and don't put them in jeopardy. Don't put your family in jeopardy, your neighbors in jeopardy," said Granger. And every time Lily gets vaccinated, she leaves the vet with this rabies tag. So other pet owners know she's up to date on her shots. "It's true every year that if you do nothing else, rabies vaccinate your animals because they can transmit them to the owners as well," said Dr.Larry Helm. Dr. Helm with the Quincy animal hospital says if your animal is exposed bring them to the vet immediately. But once they're showing symptoms it's likely too late. "The way you stop rabies is to prevent it from happening," said Helm. The Florida Department of health has issued a rabies alert for Gadsden County for the next 60 days. They warn all domestic animals are at risk if they are not vaccinated for rabies. Wild animals that commonly pass the virus: raccoons, bats, skunks and foxes.